So says Fred Phelps. You may be familiar with Phelps and his hate-mongering followers—most of whom are actually his family members—because they have been making headlines for at least the past 20 years. 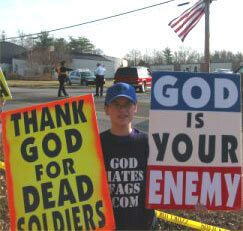 For the uninitiated, Fred Phelps is the founder and pastor of the Westboro Baptist Church in Topeka, Kansas. He is best known for his various anti-gay protests and placard-waving antics around the country, featuring such slogans as “God Hates Fags” and “Fags Die, God Laughs”, among other free speech protected hate bombs. Earlier today, the Supreme Court decided that they will hear a case involving Phelps and the family of deceased soldier Matthew Snyder. In 2006, Phelps protested at Matthew Snyder’s funeral, claiming God hates America — and hence soldiers — because of our nation’s tolerance of homosexuality. One of the signs he and others waved had “Thank God for Dead Soldiers” plastered across it. The Snyder family sued and was awarded a judgement of $10.9 million dollars. However, last September, the U.S 4th Circuit Court of Appeals, overturned the decision on free speech grounds. Snyder’s family appealed to the Supreme Court, saying the protests had “tarnished” their son’s funeral. “Matthew deserved better. A civilized society deserved better,” they said. As Chris Weigant, of the Huffington Post points out, it is not so much about free speech per se, but rather, protected classes of speech such as religious and political speech.